This May, Mental Health Awareness Month turns 68. To raise awareness of the fact that mental health issues affect individuals at all stages of the life course, we have put together a brief reading list of articles from The Journals of Gerontology: Social Sciences Series B. These articles also explore aspects of mental health that may be under-appreciated in the traditional social psychological literature as they address sociological theories, the roles that institutions, culture, and social structure play in shaping mental health. The Impacts of Service Related Exposures on Trajectories of Mental Health Among Aging Veterans by Stephanie Ureña, Miles G. Taylor, and Ben Lennox Kail in The Journals of Gerontology: Series B. One of the great lessons from life course sociology is that early life conditions affect late life health outcomes. This is as true for physical health as it is for mental health. As a result, psychological traumas experienced early in life can have long-term mental health repercussions in old age. Take wartime combat exposure, for example. Urena, Taylor, and Kail (2017) report that WWII and Vietnam veterans who witnessed the mortal injuries of others during combat experienced greater and longer-lasting psychiatric problems in late life when compared to veterans that did not experience these traumas. Their paper is an example of how sociological factors–institutionalization, social structure, and conflict between world powers–can have substantial consequences on mental health and well-being in entire cohorts over long spans of time. Widowhood and Depression in a Cross-National Perspective: Evidence from the United States, Europe, Korea, and China by Apoorva Jadhav and David Weir in The Journals of Gerontology: Series B. While mental health issues are inherently intimate and personal they also span relationships through social connections. Disruption to social networks, can be a source of depression and feelings of isolation as people age. Jadhav and Weir (2017) reveal that such disruption, vis-a-vis the death of a spouse, can lead to long-lasting depression that differs in trajectory for men and women. Interestingly, their paper demonstrates strong evidence that such interpersonal trauma affects people similarly across very different cultural contexts, suggesting that the links between depression and widowhood are global. Moreover, their findings suggest that interventions targeting the alleviation of depression following the loss of a spouse should focus on different aspects of symptoms for men and women. Passive Suicide Ideation Among Older Adults in Europe: A Multilevel Regression Analysis of Individual and Societal Determinants in 12 Countries (SHARE) by Erwin Stolz, Beat Fux, Hannes Mayerl, Éva Rásky, and Wolfgang Freidl in The Journals of Gerontology: Series B. Mental health and psychiatric issues are especially concerning when those problems lead to physical injury and death. Crude rates of suicide are highest after middle age and remain high well into late life. One indicator for the risk of suicide is having passive suicidal ideation–fleeting thoughts of killing oneself that are relatively common in old age. Stolz, Fux, Mayerl, Rasky, and Freidl (2016) evaluated whether regional differences (by European country) or individual differences better predict passive suicidal ideation among older respondents to the Survey of Health, Ageing, and Retirement in Europe. Their question is as old as sociology itself: Durkheim famously described regional variation in crude suicide rates across Europe. Stolz et al., however had the advantage of individual-level data that Durkheim did not: for the most part, regional variation was found to play only a minor role in passive suicidal ideation, with most of the effect explained by individual-level factors (such as being in poor health, having a history of psychiatric problems, and being socially isolated). By identifying significant predictors of having these thoughts, medical and social welfare professionals may be able intervene earlier in the lives of aging people. Long-Term Effects of Age Discrimination on Mental Health: The Role of Perceived Financial Strain by Tetyana P. Shippee, Lindsay R. Wilkinson, Markus H. Schafer, and Nathan D. Shippee in The Journals of Gerontology: Series B. Reducing the stigma and discrimination experienced by people affected by psychiatric problems is one of the goals of Mental Health Awareness Month. In old age, such stigma may be compounded by age-discrimination, leading to a double-jeopardy situation for declines in well-being for older adults. Recent work by Shippee, Wilkinson, Schafer, and Shippee (2017) investigated the effect that long-term exposure to age-discrimination among workforce participating women had on later-life depressive symptoms and life satisfaction. They found that, while there was a direct negative effect of experiencing age-discrimination in the workforce on depressive symptoms, this was partially offset by perceived financial strain: worrying about money partly explained having more depressive symptoms. Holding worry about finances aside, reducing age-discrimination in the workplace may alleviate some of the causes of depression in an aging workforce, improving productivity and well-being along the way. 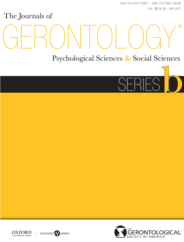 Using and Interpreting Mental Health Measures in the National Social Life, Health, and Aging Project by Carolyn Payne, E. C. Hedberg, Michael Kozloski, William Dale, and Martha K. McClintock in The Journals of Gerontology: Series B. Finally, an important and easily accessible way to advance awareness of mental health conditions across the life course is to support ongoing longitudinal research on the subject. To that end, Payne, Hedberg, Kozloski, Dale, and McClintock (2014) describe five unique measures of mental health status used to assess older adults born between 1920 and 1947 in Waves 1 and 2 of the National Social Life, Health, and Aging Project (NSHAP). These included age validated scales of depressive symptoms, happiness, anxiety symptoms, perceived stress, and feelings of loneliness. In their summary of preliminary findings from the data, they report remarkable stability of these measures within individuals over time. This suggests that, among the population of community-dwelling older adults, mental health status may be representative of long-term well-being and not of episodic spells varying between good and poor outcomes over time. If you’re interested in using the data to address your own questions about aging and mental health, this dataset is available to the public for use in research and teaching. Featured image credit: Adult Affection Eldery by Matthias Zomer. Public domain via Pexels. Christopher Marcum is the associate editor of social media for The Journals of Gerontology: Social Sciences Series B. He is a staff scientist and methodologist at the Human Genome Research Institute and his research focuses mainly on aging and the life course, social interaction and network dynamics, and demography.